One for my foodie readers (I know it’s been a lot of bike stuff lately, but that’s life!). Anyhow, I was beginning to despair of ever having peppers, and then, voila! Grocery bags full of gorgeous sweet peppers! In the interest of not reinventing the wheel, the recipe here is adapted from the stuffed zucchini recipe I shared earlier this summer. To make this recipe similar to Matthew’s grandmother’s recipe, simply use tomatoes for most of the veggies to make a nice amount of tomato sauce. Thicken the sauce with a couple tablespoons of flour, which you mix in with the sauteing onions and other veg before adding the tomatoes. 1. Prep the peppers: cut off the tops, and scoop out the seeds. Bring a large pot of water to a boil. Parboil the squash for 1-2 minutes (it doesn’t take long with these guys), until slightly tender. Drain well. 2. Prep the grain. To up the flavor, add a bit of salt, plus some onion powder and a pinch of tumeric to this step. If you want to conserve water and energy, use some of the already-heated water from step 1 to cook the grain. 3. Prep the veggies: You want everything fairly tender and ready to eat. Chop everything into bite-sized pieces. Sauté onions, then add other veggies to sauté. I used a mix of butter and olive oil, plus about 1/2 t. of salt. If you’re using tomatoes, you can just throw the chopped, uncooked tomatoes into the filling, or cook them down into more of a sauce. 4. Prep the tempeh, if using: I basically followed the method I use to prep tempeh for vegetarian reubens, except I crumbled it up first, instead of leaving it in a slab. 5. Combine it all: In one large pan or bowl (one of the ones that’s already dirty is fine, if it’s big enough), combine everything from steps 1-4. Toss in any herbs. Taste for overall salt and flavor level, and adjust as needed. 6. Stuff it and bake it: Preheat [toaster oven] to 400F. Arrange peppers, open side up, in a baking pan (for four peppers, a bread pan worked well, and allowed me to use the toaster oven). Sprinkle halves with salt. Add the stuffing. Bake for 15-20 minutes — long enough for cheese to get melty and flavors to meld a bit. 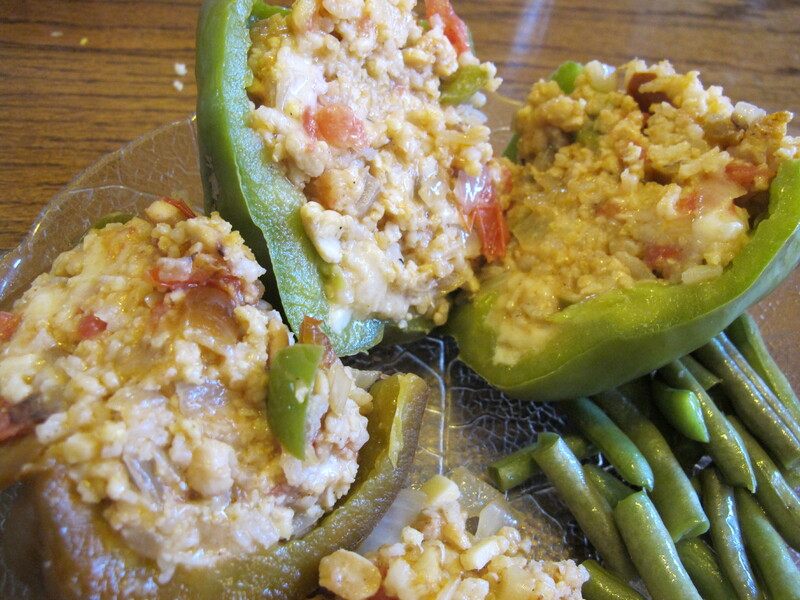 *The original recipe uses ground beef in place of the cheese and tempeh. My MIL’s veg adaptation uses all cheese. This version lightens it up a bit by replacing some of the cheese with lentils or tempeh. Matthew said it was good, but he still wants the cheesy version sometime. This entry was posted in Food, Garden, Recipes and tagged grow your own, vegetarian cooking. Bookmark the permalink. Matthew doesn’t like raw green bell peppers, and even cooked they aren’t always his favorite, but he does like the fully-ripe red and yellow ones!